There are 4 posts filed in .Net (this is page 1 of 1). I wrote this small class to illustrate the use of the Async and Await keywords which were added in .NET 4.5. 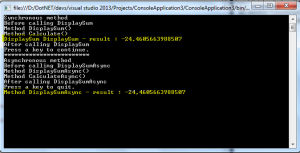 It should quickly help anyone curious to understand this easier way to write asynchronous programs in C#. 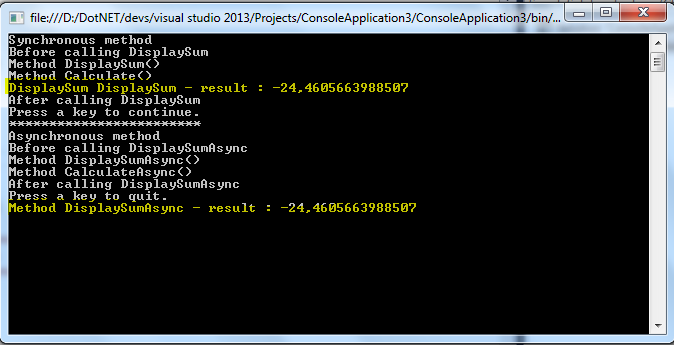 The output below (DOS window) shows clearly the difference between the call of a synchronous method and the call of an asynchronous method. The message “After calling DisplaySumAsync” (line 25) is called immediately after the call of the DisplaySumAsync() method, whether it is finished or not. The important thing to note is : the lines written in the same thread used to call the asynchronous method (which runs in another thread) are executed immediately. An asynchronous method does not block the calling function, allowing that function to continue functioning. CRM Dynamics contains native entities (contact, account, opportunity, appointment …). The CRM SDK API already contains specific classes for these native entities. are two options for that : either use crm webservice or use the CRM SDK API. With the latter option, you have to use Dynamic entity to access your custom entities.